For hundreds of years, the ancient Caddo people built earthen mounds in the special places where their leaders and priests lived. 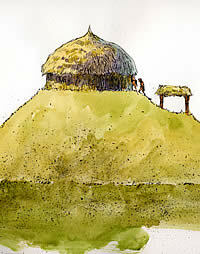 Some mounds were platforms for grass-thatched temples on top, where priests lived and held special rituals. 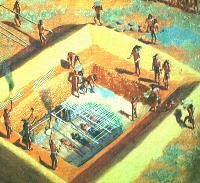 In other mounds, the Caddo people buried their leaders inside elaborate tombs. The imaginary painting above shows a funeral procession winding up the side of a burial mound. Workers strain under the weight of heavy basketloads of dirt that will be used to add a new layer to a mound. Each mound was made from thousands of basketloads of soil dug from large holes called "quarry pits." Workers carried the heavy baskets, one by one, and mounded up the dirt in a slow, back-breaking process. Caddo leaders and priests held ceremonies in grass-thatched temples on mounds like this one. This shell ornament, cut and engraved with a mysterious design, was a grave offering found in one of the burial mounds. Beautiful Caddo pots and polished stone tools, such as the axe shown at bottom, right, were also left as offerings to the departed loved ones. Unlike the burial mounds that held graves inside, the temple mounds contain layer after layer of the charred remains of large wooden buildings that were once temples or the house of important leaders (Caddis). Periodically, the buildings were taken apart and burned, perhaps because they were gettting too old or perhaps for special ritual occasions. After the buildings were burned down, they were carefully covered with a fresh, thick layer of earth. This is how temple mounds formedlayer by layer over long periods of time. 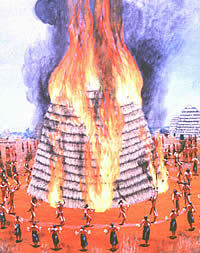 Then a new temple was built on the exact same spot, a foot or two above the charred remains of the old one. Caddo celebrate as a structure is burned, perhaps symbolizing the passing of an important leader. 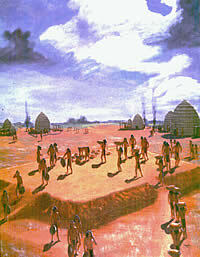 Painting by Nola Davis, courtesy of Caddoan Mounds State Historic Site. Workers make a roof-like cover over the graves and burial goods and then begin the long process of covering the tomb with dirt. 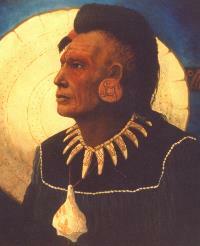 A Caddo leader known as the grand chinesi ruled over many Caddo villages and would have been one of the important people buried in one of the huge mound tombs. This painting by Reeda Peel shows some of the fine jewelry worn by Caddo leaders and later buried with them. 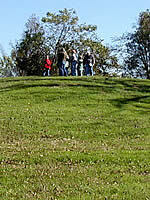 Visitors pose at the top of a mound at the Crenshaw site in Arkansas, another Caddo mound center. Over time, community leaders lived and died and were buried in the burial mounds. With each death, there were days of ceremonies with special rituals, mourning, and feasting. Some Caddo tombs dating to 500-1000 years ago contain the remains of more than one personsometimes as many as 6 or 8. Archeologists who have excavated these mounds suspect that servants and perhaps even family members were sacrificed and buried alongside the powerful leader to honor his (or sometimes her) death. Once the bodies were laid out, the Caddo people carefully added special items as offerings within the grave of the leaderjewelry made of bone and shell, finely decorated pots, and special stone tools. These things symbolized the importance of the person buried there. Some graves were covered over with a framework of poles and long grass, to make a roof-like covering over the bodies. Caddo workers dump basketloads of soil on top of a mound to start a fresh surface. Finally, workers brought in layers and layers of fresh earth to cover the tomb and make a fresh surface on the mound. Then the cycle of building, living, dying, and rebuilding began all over again. In ancient times, the temple and burial mounds were built around plazasflat open spaces like parade groundsin villages that archeologists call "ritual" or mound centers. These centers were special places where the Caddo gathered for rituals, festivals, and meetings. Sometimes traders and leaders from far away came to meet with Caddo leaders, bringing in special items from their lands, such as copper from the midwest, stones from the Appalachian Mountains and marine shells from the Gulf coast. In return, the Caddo may have given the visitors their beautiful clay pots, fine bows made of the wood of the bois d'arc tree, and salt, a particularly important mineral. 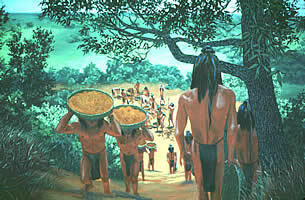 Over hundreds of years of use, the mounds in the village centers grew larger and larger. The largest ones at the oldest centers must have looked like small hills looming overhead, showing their importance to the villagers and visitors alike. Archeologists who have excavated the mounds have found that some contained up to seven different surfaces, or layers, and reached as high as forty feet above the ground! That's as high as a four-story building! It must have taken loads and loads of dirt to build. 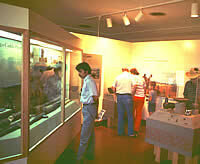 The Visitors Center at Caddoan Mounds State Historic Site at Alto, Texas, has fascinating displays telling the story of the Caddo. You also can hike on trails where the ancient village once stood and see the remains of mounds at the site. Today some of these mounds still stand as silent and mysterious places. Many others have been destroyed by farming, road construction, grave robbers, and, yes, even archeologists (who are considered grave robbers as well by some Caddos). Today, archeologists, the Caddo people, and state officials are working together to help preserve and study these sites. One of the best places to see a Caddo mound and learn more about Caddo life is at Caddo Mounds State Historic Site in Alto, Texas. The site is maintained by the Texas Historical Commission. Their website provides a map and directions for how to get there as well as information about events.